At dawn, a suitable resting site is found where a hedgehog may construct a daytime nest in which to sleep, or may simply lie-up in areas of bramble or long grass. Nests tend to be highly temporary during the summer, while they may be used over consecutive days during the autumn and winter. Nonetheless, the observation by Anni Rautio and colleagues at the University of Eastern Finland that hedgehogs in their study population, in the Finnish town of Joensuu, spent 85% or more of their year in a nest illustrates how critical these structures can be to hedgehog survival. The time taken to build a hibernaculum varies from animal to animal, and depends upon the availability of dry material. 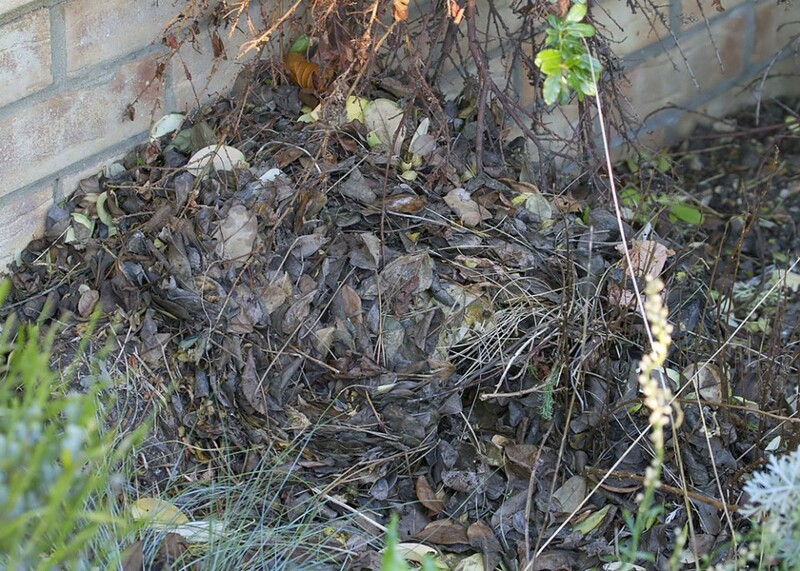 In the literature, periods range from a single day to three or four; a blind hedgehog residing in rescuer Natasha Harper's garden, for example, took four days to construct its hibernaculum. Nesting material appears to be ‘combed’ into shape by the hedgehog’s paws and spines. The ‘art’ of building appears to be honed rapidly, with observations of captive hogs showing that they start nest building at around three weeks old and have mastered it by about eight weeks. Nests may be widely spaced or clustered depending on the habitat and the individual. One recent study in Norfolk and Yorkshire observed a tendency for day nests to be situated towards the centre of the home range. While most authors refer to two types of hedgehog nests, it is worth mentioning that summer nests are sometimes split into ‘daytime resting’ and ‘breeding nests’. Nursery nests, those occupied by females from May onwards, tend to be larger than summer nests. In his Complete Hedgehog, Les Stocker notes that hedgehogs will pluck grass to line their nest and construct nursery nests more diligently than either summer rests or hibernacula. In addition, radio-tracking data on hedgehogs in Finland by Anni Rautio and colleagues has suggested as many as four different nest types were constructed, including a pre-hibernation nest that I have not come across elsewhere. Rautio and her team tracked 25 hedgehogs and located 344 nests between spring 2004 and early summer 2006; most (283 / 82%) were ‘day’ nests, 14 (4%) were breeding nests, 36 (10%) pre-hibernation nests and 11 (4%) hibernacula. Pre-hibernation nests were similar in construction to hibernacula, with a compact structure and thick well-supported walls, but were built in the run-up to hibernation. The researchers suggest that they might serve as a backup if the actual hibernation nest is destroyed. In a paper to the journal Oecologia back in 1973, Pat Morris presented data from his study on 167 winter nests from Bushy Park in west London. Morris observed that hedgehogs left the exposed parts of the park for more sheltered hibernation sites (e.g. peripheral plantations) as winter approached, with 25% of hibernacula built in November; only a few were constructed between January and March. Similarly, Amy Haigh observed a move into areas of scrub during October and November on her study site in Ireland and tracking data collected by Anni Rautio and her colleagues showed animals moving from urban areas into peripheral forest to overwinter. Haigh’s studies revealed that most summer nests were built in pastureland, while hibernacula were almost invariably constructed amongst thick bramble, which offers better support. Indeed, most (82%) of the 16 farmland nests she and her colleagues found were built in hedgerows. Rautio and her co-workers noted that just over one-third of nests were built under bushes or against tree trunks. Similarly, Carly Pettett and her colleagues report, in a paper to the European Journal of Wildlife Research in 2017, that almost half (48%) of the 40 village nests they found during their study in Norfolk and Yorkshire were constructed in scrub, 25% in buildings (under sheds or in hay barns) and 23% in hedgerows; various man-made structures were also used for nesting in villages, including sheds, compost heaps and under tarpaulin. In farmland, 75% of nests were built in hedges. A hedgehog collecting nesting material in a Hampshire garden. -Credit: Happy Hedgehog Rescue. Radio-tracking studies of hedgehogs in Nottinghamshire by Richard Yarnell and his team found that, of 31 winter nests used during the winter of 2012/2013, 33% were made in bramble, 19% in hedgerows, 19% among shrubs, 10% in rabbit burrows, 10% in vegetation around buildings and 3% in wood piles. Indeed, both Reeve and Morris found a preference for building nests among brambles; the better support prolonging nest life. The average lifespan of a nest in Morris’ study was just short of six-and-a-half months, with those constructed under supporting cover such as bramble or log piles out-lasting those that were built in less well supported areas, such as in long grass. Among the well-supported nests, some 17% could be found a year later, while only 2% of the poorly-supported ones lasted that long. Perhaps unsurprisingly, initiation of hibernaculum construction seems to be triggered by falling temperatures. In a paper to the Zoological Society of London during 1963, University of Reading zoologist E.J. Dimelow reported results from her observations on captive hedgehogs during which her subjects began constructing nests when the temperature fell below 16C (61F). Similarly, Morris observed a close correlation between the ambient temperature and the number of hogs occupying their hibernaculum; at temperatures below -2C (28F) about 13 of his study population were in their hibernacula, compared to only one or two at temperatures above 4C (39F). Anni Rautio and her colleagues noted a distinct change in behaviour during the autumn when her subjects entered a ‘transition period’; they reduced foraging activity and built new nests in which they spent most of their time. During their studies on hedgehog torpor between 1983 and 1985, Paul Fowler and Paul Racey at the University of Aberdeen found that their subjects took to nest boxes and underwent spontaneous bouts of transient shallow torpor in the period leading to final hibernation and this may be the same transition period observed in the Finnish hedgehogs. A hedgehog collecting nest material. -Credit: John Chorley. It’s not clear whether Zarudny observed hedgehogs digging these holes himself, or if he found hedgehogs in these burrows and assumed they had dug them. Hedgehogs are not particularly powerful diggers and one wonders whether the hedgehogs had actually taken over abandoned earthworks of rabbits, foxes or badgers. It should also be noted that hedgehogs may not always use a nest and can sometimes be found lying up in long vegetation. Hedgehogs typically exhibit very low levels of nest fidelity. The picture that has emerged from radio-tracking shows that nests are used periodically; occupied for a few days, before being abandoned for days, weeks or even months at a time. In his Oceologia study, Pat Morris found that 60% of the nests he surveyed were occupied for less than two months and subsequent observations implied that, despite there typically being more nests than hedgehogs in the area, hedgehogs always built a new nest after abandoning their old one, never moving into a ‘readymade’ one. More recent study data suggest this may not always be the case, however. Nigel Reeve’s tracking studies revealed non-simultaneous nest sharing, with two hedgehogs using the same nest, but at different times. Similarly, during her Ph.D. studies on hedgehogs in Ireland, Amy Haigh found that some of her subjects swapped nests during hibernation. 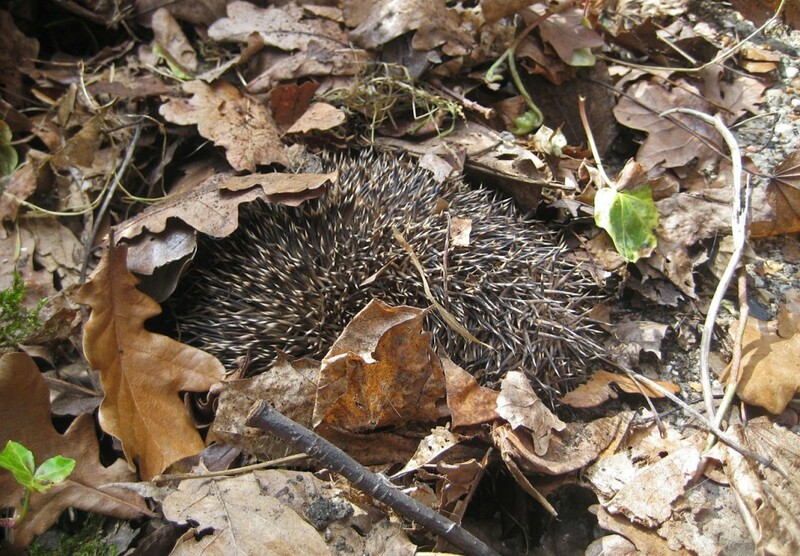 Two male hedgehogs swapped hibernacula on three occasions during the winter of 2008/2009 and an adult female and juvenile male swapped four times, one entering the hibernaculum as soon as the other had left, in 2009/2010. Haigh also observed one male to move four times during hibernation between three different hibernacula; simultaneous nest sharing (see below) wasn’t recorded. Interestingly, Haigh’s subjects didn’t always use the nearest nest to where they were foraging and some moved considerable distances to specific nest sites. One adult female in particular passed two day nests that she used regularly on her way back to a nest at the bottom of a garden. Rautio and her colleagues found that a single daytime nest could be utilised by up to three different animals, but never simultaneously. Overall, about a quarter of both sexes used a nest previously used by another hog but nest swapping wasn’t observed during winter. The researchers suggest that males may use nests sequentially early in the season, when nest construction material is in short supply. Both sexes change nests frequently, but males tend to move more frequently than females; on average every three days, compared to every ten days and in Haigh’s population the trend was statistically significant. Similarly, Rautio and her colleagues observed males with greater home ranges also had the highest number of nests and they changed them more frequently than females. One particularly active individual tracked by Nigel Reeve used 15 nests and changed nests a staggering 41 times in 68 days. Reeve suggests that the increased ‘restlessness’ of males may relate to the larger area over which they range when compared to females. Whatever the reason for the periodic relocations, nest changes are most common during the spring when hedgehogs are most active and, although less frequent during the winter months, it is rare for a hedgehog to remain in the same hibernaculum for the entire winter. To the best of my knowledge, this represents the first documented case of European hedgehogs sharing summer nests, although there is a record of a male and female of the related Erinaceus concolor sharing a summer nest in Israel from the early 1980s. At The Day of the Hedgehog, a conference organised by PTES and the BHPS and held in Shropshire in November 2015, Pat Morris summed the situation with hog boxes succinctly when he remarked that they may not help, but they can’t hurt. Food & Feeding - Feeding Folklore?